In recent years considerable research progress has been made in the field of well-being and neuroscience. Now, neuroscience of well-being is not only limited to mindfulness meditation, it has progressed in many areas of well-being like exercise, office work load, school load, yoga, food, nutrition, financial fulfillment, social interaction and in many other areas. Science of well-being is an interdisciplinary science that collaborates with other fields such as medicine, neuroscience, neurobiology, physiology, chemistry, psychology, genetics, behavioral science, social science and economics. In this article we discussed ten neuroscience based well-being measurement indicators. Earlier, the science of well-Being was mostly avoided by the scientists due to lack of good ways to measure it; however, in recent years, neuro-scientists have found ways to measure the degree of well-being by measuring various indicators like levels of gray matter (GM) volume, insula volume, cortical thickness, and the levels of the neurotransmitters specially endorphins, serotonin and dopamine in the brain. These are used as the physiological indicator for short-term as well as long-term well-being. These objective well-being neural indicators can assist individuals in their everyday life decisions, such as where and how to live. The neuroscience needs measures how the brain engenders the mental patterns as we experience well-being. 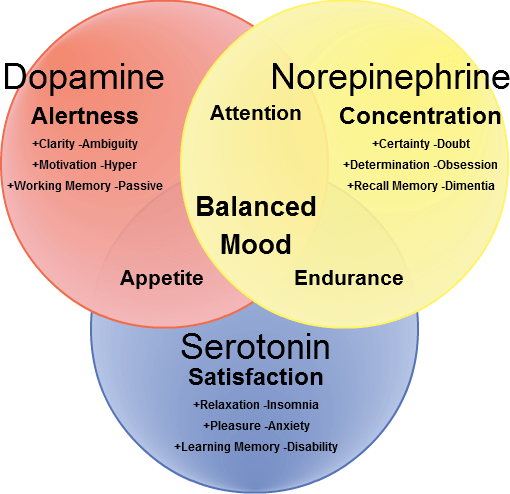 Three neurotransmitters; dopamine, serotonin, and norepinephrine appear to work together for individual well-being. 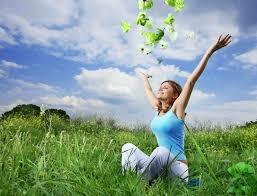 Serotonin is an inhibitory neurotransmitter – which means that it does not stimulate the brain. It balances any excessive stimulating. neurotransmitter firing. Serotonin is important for managing mood, appetite, sleep, and dreaming. If your serotonin levels become low, one may become irritable, anxious, depressed, and have trouble sleeping. Dopamine is most famous for its stimulant and pleasurable effects. Dopamine is considered to be both excitatory and inhibitory. Norepinephrine is similar to dopamine in that it also produces alertness, focus and motivation. Low levels of norepinephrine are associated with low energy, decreased focus ability and sleep cycle problems. Current research on well-being has been viewed from two general perspectives: the hedonic approach, which focuses on happiness and defines well-being in terms of pleasure attainment and pain avoidance; and the eudaimonic approach, which focuses on meaningfulness in life. Hedonic is more about physical pleasure. Eudaimonic is a higher form of pleasure. Eudaimonic well-being is more closely linked to human potentials: aspects of life relating to flourishing and character development. Eudaimonic well-being reflects traits concerned with personal growth, self-acceptance, purpose in life, and freedom of living. It is a substantial predictor of life events, including health. It is the ultimate fulfillment of a human existence. It includes helping others in need, expressing gratitude, and working toward long-term goals. Measuring eudaimonic well-being poses harder challenges to psychology and neuroscience. However, researchers observed that eudaimonia did correlate with gray matter volume. More exactly, purpose in life, positive relations, and personal growth correlated with the GM volume of the right insular cortex. Additionally, personal growth also correlated with left insular cortex volume, and purpose in life had a “marginal” negative correlation with the middle temporal gyrus..
People who are higher in eudaimonic, or long-term, well-being have reduced biomarkers of inflammation, like interleukin-6 (IL-6). These biomarkers are linked to a number of health problems like metabolic syndrome, diabetes, and cardiovascular disease, so lower levels of them offer a protective benefit. Lower levels of well-being are associated with increased sensitivity of the immune system, specifically IL-6, with repeated stress. Hedonic rewards provide short-term feelings of happiness and satisfaction. Hedonic well-being tend to be more extrinsically rewarding and self-focused, including food consumption, playing video games, talking on phone with friends, going shopping for oneself, and musical pleasures, but also can involve risky behaviors, including getting drunk. Many researchers think that pleasure-seeking behaviors are not necessarily good for the individual and therefore do not promote positive, enduring well-being. However, neuroscience has identified key brain mechanisms involved in the experience of well-being for both eudaimonic and hedonic are associated with activation in the same neural circuitry, in particular, the ventral striatum, a key brain region consistently linked with the experience of pleasure or happiness. We proposed ten neuroscience based well-being measurement indicators. They are gray matter volume, insula volume, cortical thickness, activity in the default mode network (DMN), and the levels of three neurotransmitters; dopamine, serotonin, and norepinephrine. Gray matter volume, insula volume, and cortical thickness indicators are good for measuring the eudaimonic well-being and the levels of three neurotransmitters; dopamine, serotonin, norepinephrine and activity in the default mode network (DMN) are good for hedonic well-being. Brain weight and brain volume can be good indicators for well-being measurement at national level. Eye movement can be a very common indicator to access the status of individual well-being. Objective measurement is one major strength of neuroscience based well-being measurement. We discussed ten neuroscience based well-being measurement indicators. These indicators usually can be relatively easily defined and quantified without relying heavily on subjective measures. As a result, it is technically convenient to make neural well-being indicators for comparisons of social indicators across nations, regions, demographic sectors, and time. Optimal well-being measurements are achieved through eudaimonic activities. Hence, more emphasis should be given for the measurement of gray matter volume and cortical thickness change. By highlighting well-being studies with measures, this special article is intended to further the understanding of the science of well-being. Standardization, large-scale research, like epidemiological studies are beneficial for developing more comprehensive frame work of neuroscience based well-being measurements at national level. Gary J. Lewis et al., Neural correlates of the ‘good life’: eudaimonic well-being is associated with insular cortex volume, Oxford Journals, Social Cognitive Affective Neuroscience (2013). N Rohleder. “Stimulation of Systemic Low-Grade Inflammation by Psychosocial Stress”. Psychosomatic Medicine. (2014): 181-189. This entry was posted in Articles, Brain Research, Conscious Living, Health, Meditation Research, Neurogenesis, Well-Being, Yoga Research and tagged Default mode network, Eeudaimonic well-being, eudaimonic well-being, Measure of Wellbeing, Science of Well-Being, well-being, well-being measurement, well-being measurement indicators. Bookmark the permalink.